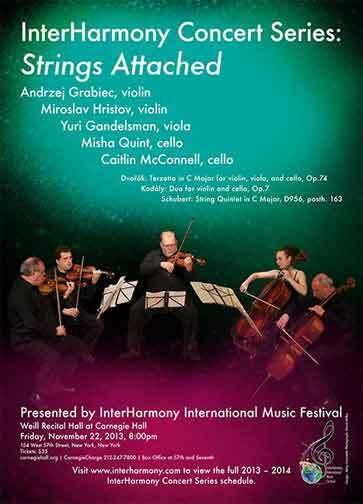 The InterHarmony International Music Festival presents the second in a series of three concerts on February 6, 2015 at 8 p.m. at the Weill Recital Hall. 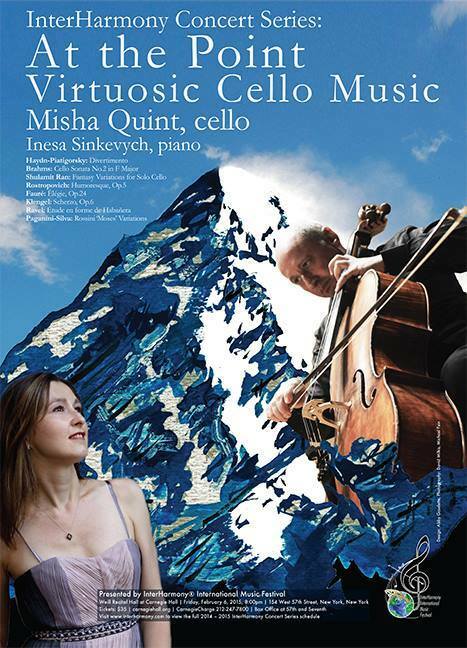 The program, featuring cellist Misha Quint, founder of IIMF, will consist of works created by and for the greatest cellists of the 19th and 20th centuries, from Klengel and Hausmann to Piatigorsky and Rostropovich. 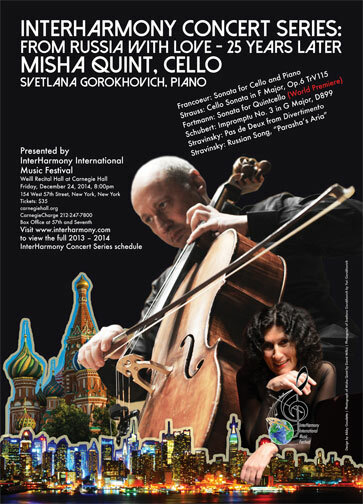 Pianist Inesa Synkevich will accompany. 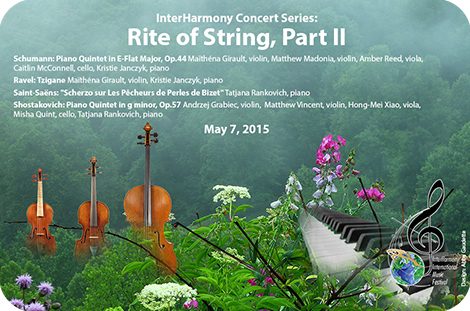 The IIMF's 2014-15 Series concludes May 7, 2015 with Rite of String, Part II, featuring distinguished students and faculty. 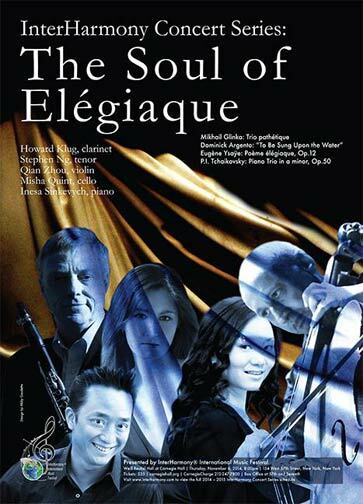 For tickets call CarnegieCharge at 212.247.7800 or, for more information, go to www.interharmony.com. Great composers are remembered forever, but the names, stories and achievements of great performers are often forgotten. Nevertheless, music's very existence depends upon them. More than mere mouthpieces, they are close collaborators, instigators, and creators in their own right. Carrying on this tradition, IIMF presents a program of music commissioned, arranged and composed by some of the greatest cello virtuosi of the last 200 years, in which they combine technical prowess with a deep and intimate knowledge of the essence of their instrument. 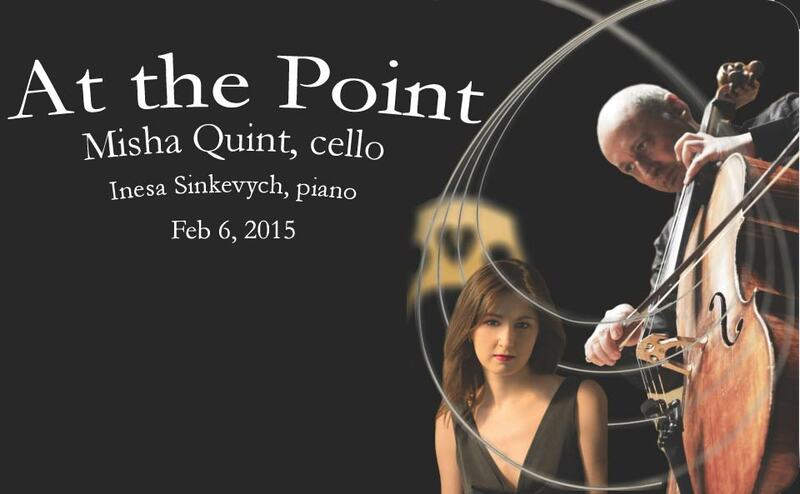 Join us February 6th at Weill Recital Hall for an evening of cello music 'at the point': the apex of cello-playing from the hands of one of today's consummate masters. "I really get into the depth of the instrument's soul and try to ... find ways of making new music and the instrument come together in a manner that is meaningful and beautiful." In these unrestrained, almost improvisational variations, the cello takes on distinct personalities which converse in a kind of stream of consciousness. By experimenting with bravura techniques, Ran produces a wide range of timbres, her abstractions coming in and out of focus, condensing into baroque dances only to dissolve again into formless beauty. Julius Klengel, though less well-known to the listening public, is a legend among cellists. Born into a musical family in Leipzig, he was quickly recognized as a wunderkind. By the age of 15, he was performing with the prestigious Gewandhausorchester. A gifted teacher, he wrote hundreds of technically demanding pieces to challenge his students. No dry study, his Opus 6 is a Scherzo: a 'joke.' Despite its nightmarish difficulty, it must be delivered with the playful timing of a punchline to come off. Its mischievous harmonic runs are as likely to coax a smile from the audience as they are to reduce the performer to tears. Brahm's Cello Sonata Nr. 2 in F major belongs to his great late Classicism. He wrote it for a close friend, cellist Robert Hausmann, to whom it is dedicated and by whom it was first performed. Hausmann was a member of the Joachim Quartet, the most prestigious chamber group of its day, whose members, individually and as a group, were Brahms' closest collaborators. In the opening theme, the cello, in broken, yearning melodic fragments, seems to struggle against implacable opposition to reach into its highest registers. The famous adagio movement which follows, with its searching pizzicato lines, unexpected key changes, and warm, expressive chromaticism, contains some of Brahms' most memorable music. Gregor Piatigorsky, Klengel's greatest student, is a legendary figure among cellists. Once described as "the greatest string player of all time," he brought the art of the cello to a previously unheard of level, despite living a life at least as dramatic as his music. After run-ins with Soviet authorities, he made a harrowing escape over the Polish border to seek musical freedom abroad. He was discovered by the conductor of the Berlin Philharmonic playing in a café, and soon became their principal cellist. As an active arranger, he expanded his instruments repertoire in unexpected directions. In particular, his arrangement of Haydn's baryton trios, the Divertimento in D major, rescued an overlooked jewel from obscurity. On the orders of his patron, Prince Nikolaus von Esterházy, a passionate amateur barytonist, Haydn had produced nearly 200 works featuring the now nearly forgotten instrument in various ensembles. By adapting the baryton part for its closest modern relative, the cello, Piatigorsky created a new piece of great beauty which preserves the character of Haydn's originals. Like most of the baryton trios, it begins with a slow, singing, galante movement; the finale, Allegro di molto, is fast and virtuosic, but maintains a pure sense of delight, rejoicing in its own difficulty with aristocratic elegance. Rossini's 'prayer-aria' "Dal tuo stellato soglio," from Mosè in Egitto, was one of the most popular operatic numbers of his day. Moses, accompanied by a chorus of Israelites as they flee Egypt, prays to God to protect them from Pharaoh's approaching army. Their prayer, of course, is answered, but Rossini's preghiera captures the humble faith of the Israelites in the moment before they are delivered. In the same year he wrote Mosè, Rossini befriended Paganini, who was taking the first steps toward worldwide fame of his own. A master of the genre of variations, Paganini adapted his friend's beloved preghiera to his own needs as a traveling virtuoso of spectacular skill and showmanship. Much of his work as a composer includes, like this piece, firework displays of technical mastery, but rarely with such contagious exuberance. The variations are played on a single string to maintain a singular character throughout, challenging the performer to disguise the difficulty behind their melodic beauty. In 1937, the great performer and arranger Luigi Silva transcribed them for the cello as the Paganini-Silva Variations on a Theme of 'Moses' by Rossini. Ravel's Vocalise-étude en forme de Habañera exploits the cellos unique proximity to the human voice, as well. Originally written as a wordless song to explore the expressive and technical possibilities of the bass voice, the Vocalise-étude was later transcribed by the composer for cello and piano. Its slides, runs and ornaments make this passionate aria for cello as dramatic as it is demanding. In this period of his work, Ravel, like Bizet before him, whose famous habañera from Carmen is echoed here, turned to Spain for new melodies and rhythms. For Ravel, this was more than a mere fashion, however: in this piece, in particular, he reaches back to the Basque and Spanish folk melodies his mother sang to him as a child. Mstislav Rostropovich was, alongside Piatigorsky, one of the 20th century's most influential and accomplished cellists. Audiences and performers alike are in his debt for expanding the cello repertoire more than any cellist before him: by commissioning, premiering and championing new works - but also as a composer himself. As a student in Moscow, he was thought to be as promising a composer as a cellist. By his own account, he wrote and memorized his Humoresque, Op. 5, in the space of an evening, as a birthday present for his composition teacher the following day. Witty and joyous, stunning yet effervescent, it became one of his favorite encore pieces. Witty and joyous, stunning yet effervescent, it became one of his favorite encore pieces. Ukrainian-born pianist INESA SINKEVYCH has risen rapidly into the musical spotlight, captivating audiences around the world as recitalist, chamber musician and orchestral soloist, in venues such as the Mann Auditorium in Tel Aviv, the Purcell Room at the Royal Festival Hall in London, the Palau de la Música Catalana in Barcelona, and the Hong Kong City Hall, as well as performing as soloist with the Israel Philharmonic Orchestra, the Minnesota Symphony Orchestra, the Gulbenkian Orchestra of Lisbon, and the Gran Canaria Philharmonic of Spain, among others. A laureate of the 12th Arthur Rubinstein International Piano Master Competition, Inesa has also won first prizes in the Maria Canals International Piano Competition in Barcelona and at the Concurso Internacional de Piano Premio "Jaén" in Spain, as well as awards in the Minnesota International Yamaha Piano-e-Competition, the Vianna da Motta and the Porto international competitions in Portugal, the Casagrande International Competition in Italy, the Panama International Competition and the the Cidade del Ferrol and the Spanish Composers competitions in Spain. Ms. Sinkevych has recently received her Doctor of Musical Arts Degree at the Manhattan School of Music under the tutelage of Solomon Mikowsky. She has been a member of the Manhattan School of Music piano faculties of the College Division since 2014 and the Precollege Division since 2008. 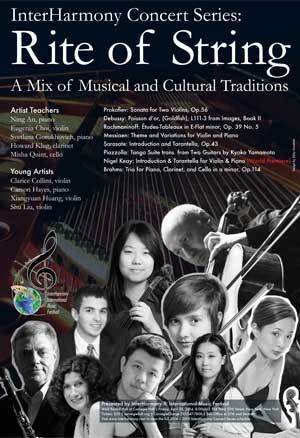 InterHarmony International Music Festival has been taking place in European and American cities for the past 13 summers, transports the excitement of its European music festivals to New York City for a series of 3 concerts for the second season. Come see our World Premieres and little-known works performed by amazing players.